How do you define generosity? For many of us, our minds go to money and giving money to worthwhile causes, organizations, or people. And while this is generous, we should also be looking at generosity in terms of our time, talents, and gifts. In our podcast a few weeks back, we talked about Being Generous and what impact that can have on our confidence, our mental state and ultimately our businesses, careers, and families. The idea behind generosity is using your time and talents to help guide, mentor, or coach others. We each have a unique set of talents that many others do not possess. It is our job to ensure we are being generous with those talents. We are not given our talents to just have an impact on our own lives, we are given these talents as a gift to everyone around us in our lives. Often times we do not share our talents with others, we hide them or discount that they are talents. When we do that, others around us suffer because they could use those talents to help them expand their mind and their overall thinking. 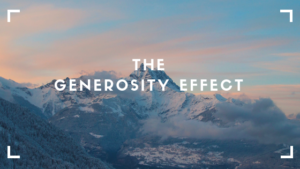 What effect would it have on your life and your business if you were to increase your level of generosity? What areas could you use your talents and gifts more extensively and with more impact? What we see is that people who increase their own generosity typically see the return on that generosity come back multiplied, i.e. you have to give to receive. And when you give big of your time and talents you receive that energy back into your business, career, or personal life. What would happen in the world if we all committed to increasing the time we spent being generous by 1 hour a week? That would be one more hour to mentor someone who is thinking about changing careers or starting a business, one more hour to spend coaching a college student on how to make that transition into the working world successfully, one more hour spent helping our peers at work think about our decisions and approaches differently to drive greater results in our organizations. What impact would that have on our world and the world around us? I challenge you to find one more hour a week to live generously and see what kind of impact the generosity effect could have for you!